Comparing Savory Sweets to Other Fund-Raisers is Like Comparing Apples & Oranges. Our Gourmet products are truly unique. 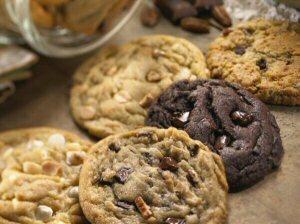 Savory Foods is proud to manufacture products that encourage a fun, at home family activity... fresh, Homestyle Ready-to-Bake Cookies. Our uniquely delicious cookie dough is a great family treat, and it's fun & easy to enjoy together. Most people compare our cookies to the expensive gourmet cookies at the mall. However, our cookie dough is not available in any store. Savory Foods Homestyle Ready-to-Bake Cookies and our exclusive Cookie Cube™ are available only as a fund-raiser. For variety, we've added both Gourmet Caramel Corn (a favorite family treat) and Lavalicious Fudge Cakes (a dessert that's out of this world.) Our delicious products have helped thousands of schools, churches, cheerleaders, little leagues, soccer teams & other non-profit organizations raise funds in a new, exciting & unique way! Wrapping paper, calendars, magazines... everyone has been asked to buy them as a fund-raiser at one time or another. You may have already used these fundraising concepts for your organization in the past. If so, you're aware of the many negatives associated with an ordinary fund-raiser. Fortunately, Savory Foods Gourmet quality offerings are like no ordinary fund-raiser. People do not buy our products because they feel guilty... they buy because they're delicious, value-driven items that are truly unique. When was the last time you called the person who sold you a product as a fund-raiser and asked for more? Most of our fund-raisers now plan a follow-up sale to handle the additional demand that comes from offering naturally fresh and delicious products! Our fundraising concept is so easy to do, that it has become the main event for many organizations throughout the nation. At Savory Foods, we put the fun back into fundraising! In the photo on the right, a Flint, Michigan area AYSO group raised nearly $17,000! That's the kind of result that a Savory Sweets fundraiser can generate. Savory Foods Homestyle Ready-to-Bake Cookies are sold in our exclusive 3 pound Cookie Cube™ Just like the name says, they're ready to bake! Each Cookie Cube™ makes about 48 one-ounce cookies. Add four flavors of Gourmet Caramel Corn in one gallon and half gallon tubs, and Savory's decadent Lavalicious Fudge Cakes and you have the makings of a record breaking Fundraiser! Determine the dates you will host your fund-raising event. We'll help in planning your schedule and answer all your questions. We'll ship our easy-to-use order forms once your sale and delivery dates and the number of sellers you have are finalized. Include at least two full weekends in your selling schedule for best results. Report your total sales to your fund-raising coordinator at the end of week #2. Use our free Sales Tally Software. Your fund-raising coordinator will call Savory Foods with the total sales results. Your order will be produced fresh and delivered at the end of week #4. We want to assist you in any way possible. We'll help determine how best to organize and keep track of the orders and product pick-up on delivery day.